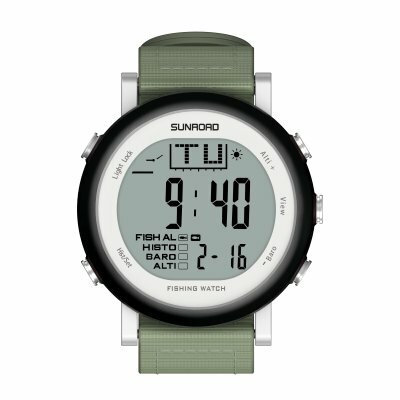 Successfully Added SUNROAD Fishing Barometer Watch-FR721 Digital 5ATM WaterProof Multifunction Sport Watches (Black) to your Shopping Cart. Never miss the perfect fishing time again thanks to the Sunroad FR720 5ATM fishing watch. This remarkable outdoor watch treats you to an abundance of fishing features that keep you constantly up to date about when is the right time to head out on a fishing trip. This little gizmo is capable of tracking 6 of your favorite fishing locations at once. It keeps constant track of the air pressure, fishing water depth, and temperature. Thanks to its 5ATM waterproof design, you can wear it with confidence during your upcoming fishing trips without needing to worry about getting in contact with water.